Dr. Joseph P. Crowley. A native of Cincinnati and a resident of the practice area for over fifty-five years, Dr. Crowley has been in this private practice since its inception in 1976. He attended LaSalle High School, three years at Xavier University and completed his Doctorate in Dental Surgery at The Ohio State University College of Dentistry. Dr. Crowley is a member of the Cincinnati Dental Society, the Ohio Dental Association, and the American Dental Association. He is currently the President Elect of the American Dental Association. He previously served as Trustee for the American Dental Association. 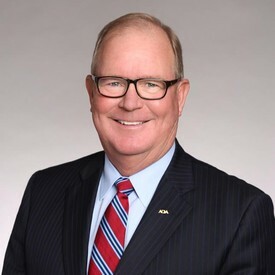 He is also former chair of the ADA Council on Government Affairs, was chair of the ADA Audit Committee and was on the American Dental Political Action Committee Board of Directors. Dr. Crowley was the president of the Ohio Dental Association from 2005-06 and president of the Cincinnati Dental Society in 1996. He is a member of the American College of Dentists, International College of Dentists, Ohio State University College of Dentistry Alumni Advisory Board, L.D. Pankey Institute Alumni Association, Pierre Fauchard Academy and the Academy of General Dentistry. Joe and his wife, Pauletta, have three magnificent children and six wonderful grandchildren. Dr. Andrew Bartish is a lifelong resident of Cincinnati. Born and raised on the West Side of town, he graduated from St. Ignatius Grade School and St. Xavier High School. Following graduation Dr. Bartish received an academic and athletic scholarship to Butler University. He received a Bachelor’s degree in Chemistry and was a 4-year starter on the tennis team earning academic and athletic honors from the Horizon League all four years. Dr. Bartish attended the Ohio State University College of Dentistry, receiving his doctorate in dental surgery in 2010. He spent the following year earning hospital based training in dentistry, anesthesiology, internal medicine, and oral surgery while doing a General Practice Residency at Nashville General and The Veterans Hospital in Nashville, TN. His goal is to provide excellent clinical dentistry with a particular interest in Cosmetic and Implant Dentistry and continues to educate himself to provide the most state of the art care. Dr. Bartish is a member of the Spear Study Club, the American Dental Association, the Ohio Dental Association, and the Cincinnati Dental Society. In his spare time Dr. Bartish enjoys playing golf, tennis, and spending time with his wife Meggie and dogs Rusty and Tucker.